A Listener's Guide To Schubert's 'Die Schone Mullerin' Tenor Matthew Polenzani and pianist Julius Drake lead a journey into Schubert's vivid song cycle. NPR and stations around the country invite today's most exciting classical artists into the studio. What does an opera star love about singing intimate art songs from a barren stage with no sets and no other singers? 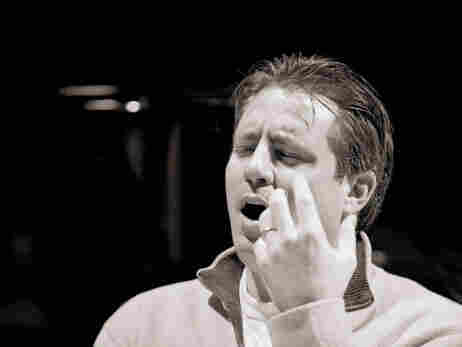 Lyric tenor Matthew Polenzani adores the sheer directness of it. With no props, no costumes and no distractions, he is free to sing into the very eyes of his audience. While that can be frightening, it's clear that he finds the intimacy refreshing. "You can sing right to someone and deliver a stab right at them," he says. No fake daggers needed for that kind of stab — just an awful lot of depth, honesty and control. Critics give Polenzani the highest praises for the near-perfection of his technical command. There's an incredible clarity and flexibility in his voice. It rings even when it whispers. Audiences are riveted — and so was I, sitting close to him in our Fraser Performance Studio, listening to him sing these songs from Schubert's Die Schöne Müllerin. Polenzani has been singing with pianist Julius Drake for five years now. It was Polenzani's manager who suggested the match when the idea of recitals came up. Both artists are relaxed and quick to smile, and they're both happy to rethink their musical decisions. Being a part of such a team means spending time searching together for truth and meaning in the poetry. And, harder still, understanding the brilliant, often devastatingly simple ways that a composer like Schubert amplifies his chosen text. In the song "Die Liebe Farbe" (The Beloved Color), a wandering miller faces the devastating reality that the girl he loves does not love him in return. Drake marvels at the heartbreaking, unrelenting sadness that Schubert unleashes by keeping one note tolling throughout the song. "I don't know how he does it," Drake says of the composer. These are the kind of Schubert moments that artists analyze from every conceivable angle, and yet they still find themselves awestruck. As the miller's heart follows its sad and unstoppable march toward grief, Drake remains faithful to the music's constant tolling. He is focused and quiet at the piano. He gives Schubert's blooms of harmony a sad warmth and a deep feeling of resignation. I could see Polenzani falling instantly into the sadness of the atmosphere. You'll hear him allow a new vulnerability into his voice. It's fascinating to consider the kind of technical awareness that a singer has to maintain, especially at emotional climaxes. How do you keep and lose control at the same time? Polenzani says that, no matter whether you're singing Verdi or Schubert, it doesn't always work. When it does, though, it's as good as it gets.